The impressive city of Prague is the start of your journey, as you take a journey through history and a lot of great sightseeing sights. Dresden is the end of this beautiful tour with the Zwinger Palace, Semperoper (Opera house) and the Frauenkirche (church of lady’s) all waiting for you! Between these two cities you cycle along the rivers Moldau (Vltava) and Elbe, visit picturesque villages and cross romantic landscapes. Enjoy the panoramic view from the Elbe Sandstone Mountains. This landscape is really impressive and you'll see the countryside between Prague and Dresden. In the evening welcome briefing and distribution of rental bike (if booked) in Prague. One overnight in Prague. In the "Golden City" there are a lot of sights to admire. Come and see the Hradschin with the royal palace, take a stroll over the famous "Karlsbrücke" (Charles Bridge) or enjoy the various nightlife of Prague. Overnight in Prague. 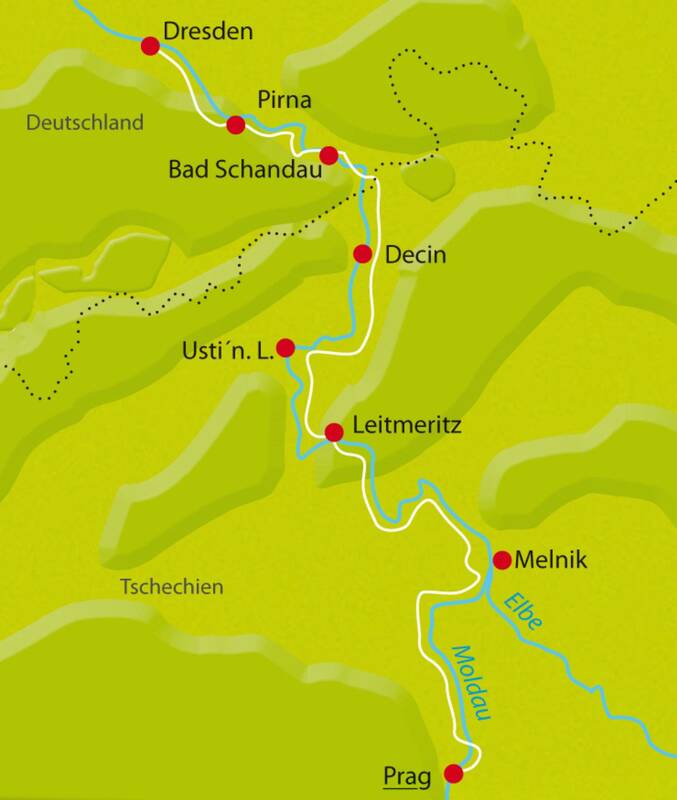 Cycle tour leading along the river Moldau. Enjoy a beautiful view from the rock of the castle in Melnik on to the river junctions of Moldau and Elbe. Melnik is the city center of the bohemian wine-growing region. One overnight in Melnik. Passing Roudnice you reach the fortress-city Terezin (Theresienstadt). Only a few kilometres away you find the destination of today - Litomerice (Leitmeritz) with beautiful domestic architecture. One overnight in Litomerice. After approx. 20 km you reach the city Usti nad Laben (Aussig). On your way you may visit the castle ruin Schreckenstein on the right riverside. You reach Decin in the afternoon (Tetschen). One overnight in Decin. You pass the border of Germany and soon picturesque rocks get in sight. The course of the river Elbe leads you to the fortress "Königsstein". Come and see the greatest fortifications and enjoy the beautiful view to the valley of the elbe. One overnight in Pirna. You cycle past the castle Pillnitz to Dresden. Enjoy the wonderful old town and the impressive buildings of Dresden. One overnight in Dresden. After breakfast individual departure or additional pleasant stay. Easy to moderate heavy! You have to negotiate a few gradients, apart from that the route is mainly easy to cycle on the Elbe bike path. A few ways are unpaved. We recommend flying to Prague airport to reach the starting point of this cycling holiday. The Elbe Cycle Path: Prague to Dresden cycling holiday includes the daily transfer of luggage to the next hotel and local support if required.